Clear blue skies and sunshine greeted us at Aston le Walls [Tuesday, 23 February 2016] for our xc sessions with Jeanette Brakewell. 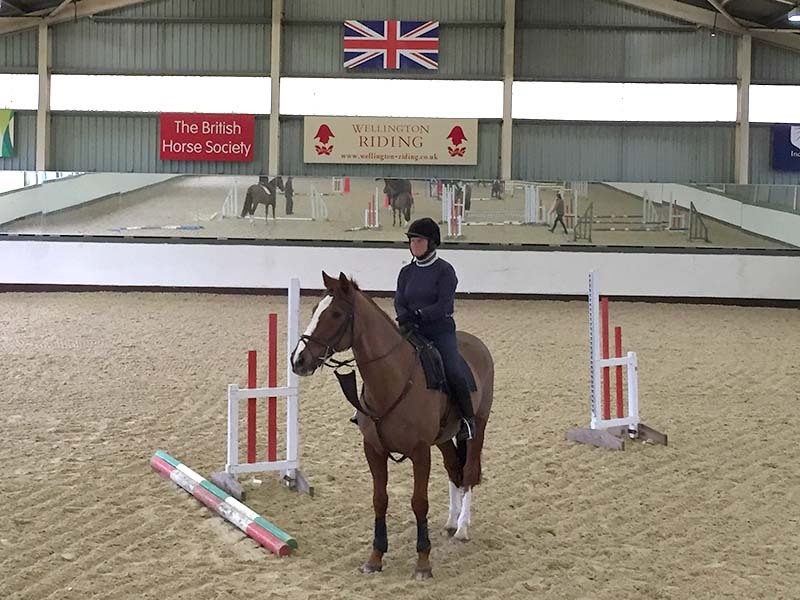 Four riders with 7 horses took advantage of Jeanette’s wealth of knowledge and experience which she was able to impart easily, always working on the basics with horses staying straight and to both reins. 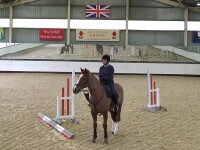 All the horse improved with the all weather arena at Aston giving them the confidence to keep progressing. One young horse had never been xc before and with Jeanette showing her the way by jumping the ditch herself, within minutes the little mare knew exactly what to do. No big deal and no big battles.. 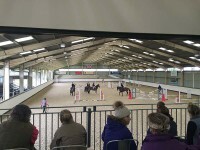 So with a complete baby through to an intermediate horse there were enough fences and questions to keep everyone busy. Jeanette made corrections to rider’s positions to help them stay secure but supple enough to allow the horses to do the work. 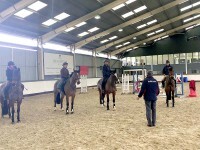 Discussions were had to continue to develop the work at home relevant to the individual horses. The riders were a credit to our Association being focused and able to adapt their lines of approach when the arena became a little busy with some not quite so educated people were having a hooley!!! Thank you to Catherine Shine for organizing the day. David Sheerin and the team at Wellington organised another superb training day making the most of all the fabulous facilities that Wellington has to offer. 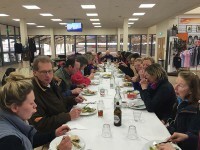 Richard had two training aims for all the riders at Wellington. The first being to establish the correct way of going and canter that is needed for the exercise and then maintain that canter on the way into and away from the fence. The second aim was to get the horses working more from behind and using their hindquarters more effectively, using a variety of exercises to encourage them to do so. Richard used a combination of very simple exercises for all the 24 horses making a few necessary empathetic adjustments where required. All sessions began by working over two poles on a straight line related distance. 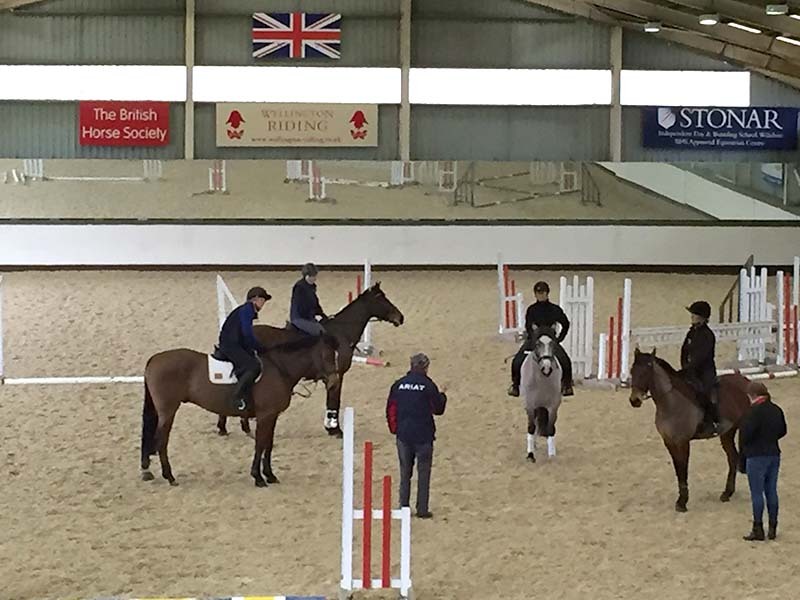 Richard asked riders to initially canter over the two poles and count the canter strides that the horses naturally produced in the distance. 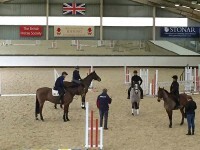 Then Richard asked the riders to work on having 6 short and bouncy canter strides between the two poles. Richard instilled in the riders that they needed to produce the correct canter well before the turning to the related distance in order that the horses maintained the same rhythm throughout the exercise. This was done on both reins before then raising the later pole into a fence and then finally the first also. Throughout Richard instilled in riders the need for consistency in approach and landing from the related distance. Some of the younger horses, including one of mine, found this very hard work and so Richard encouraged the riders to focus on a regular balanced canter that allowed the horses to be consistent in their approach and departure from the distance. Once this exercise had been completed horses and riders then moved on to a line of three bounces to a related distance of a short 6 strides to another three bounces. Again the emphasis was on the quality of the canter and the consistency in the approach through the bounces and the distance and the bounces again. From there Richard then had riders working through one set of the bounces and then turning on a related distance to an upright on the right rein or an oxer on the left rein. The bounces ensured that the horses worked effectively off their hocks and had to really use their backend and lift their forehand. In the afternoon with the more established horses Richard also added in an exercise of three canter poles on a circle to a related distance to an upright. He also stretched the horses and made them use their scope and power by significantly raising the upright and the oxer. I for one could feel how these exercises made the horses come off their forehand and become more uphill in their canter and their way of going. The exercises were very positive and it was possible to see the horses and riders actively growing in confidence throughout their sessions. As ever it is always useful to work on exercises simultaneously with other professionals and watch how they and their horses react to the exercises. The day began with the younger, greener horses and some riders that hadn’t jumped in a while. It was also good to see riders borrowing mounts from Wellington and finding their sessions beneficial, positive and educational. There was a lot to be learnt from watching these combinations and witness how they benefited and grew in mutual confidence through the exercises once the canter had been established. It was good to see some riders who hadn’t jumped since this day at Wellington last year, having a fun and educational session. During the lunch break David and Richard helpfully ran a loose jumping demonstration. This is the second year that this has happened and it is a really useful forum for discussing the loose jumping process, from start to finish. Richard has extensive experience of loose jumping military horses and it is incredibly helpful to garner his insights regarding how to do it properly and make it a constructive and worthwhile exercise for all. Richard was very understanding about how his support crew for the demonstration were not military and perhaps a little less responsive than his former soldiers! Two horses were loose schooled, the first a five year old mare that had recently begun regular work and the second a four rising five year old that is not currently in work. Neither of the horses had loose jumped before and it was most beneficial to see how they reacted to the exercise and benefited and developed throughout. The feedback on this was entirely positive. As a group it is clear that members find this a useful forum for discussing the process itself and then more detailed specifics of how these two horses went. Special thanks must go to Catherine Shine and Helen Cole for kindly bringing their lovely young horses and allowing them to be loose schooled. 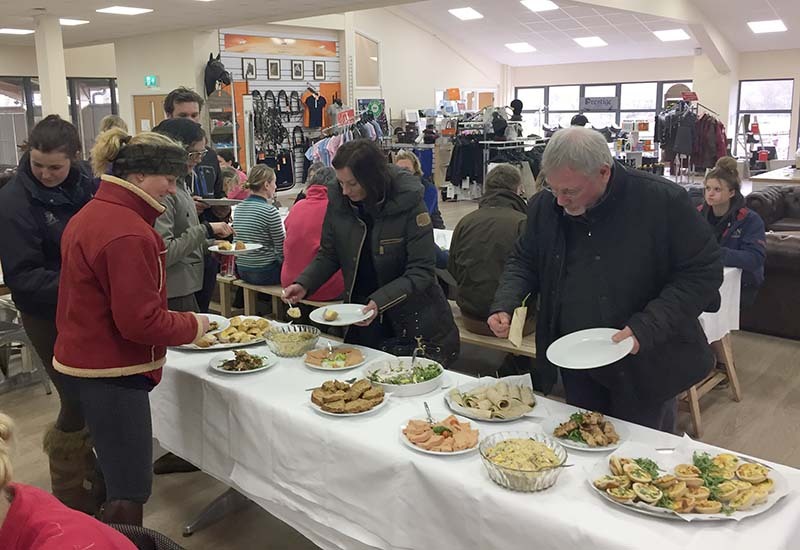 Particular thanks must also go to David and his team for laying on a delicious and plentiful buffet for all the riders and spectators. It was a real treat to be able to sit down to a delicious lunch and chat with all the fellow attendees. It was a thoroughly positive enjoyable day. The feedback has been entirely encouraging. Thanks must go to Richard for educational, positive coaching, providing us all with much to work on and to take forward into our own coaching sessions. 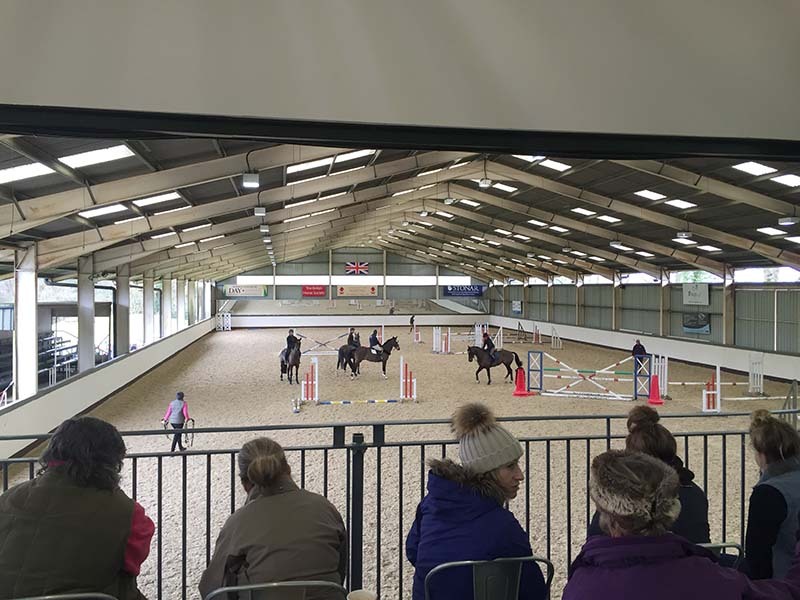 Thank you also to David and the Wellington team for organising a fabulous day and allowing us the use of the new wonderful facilities at Wellington and for putting together an entertaining video of the whole occasion which is available below. Report written by Claire Chamberlayne.